Do you find that the greatest revelations occur when you're seated at your kitchen table talking with friends? Two friends from my state's Surface Design Association came up Saturday for a play date in my studio. Duh. I've given students in the eCourses I teach instruction on how to post comments, questions and photos on the course site. But I've given them very little guidance on how to use reflective writing as a tool for learning and why they would want to do so. As soon as I finish posting this bit of reflective writing, I'll email that observation and a couple more to the Gang of Four that hangs out at a virtual kitchen table built of four email accounts. They're fiber arts instructors who agreed to join me in this MOOC. (Becka calls them "conscripts." It's not inaccurate). We four are a tiny subset of the 42,000 people in the online class. Collectively, I'm sure that hive-mind could solve the problems of the universe, except that the answer would be lost in the babble. The Gang of Four, on the other hand, gets to the point. And I trust them (more than myself, to tell the truth) to sniff out B.S. dressed up in academic jargon and call it what it is. We're in the second week of the class we're taking, and even one more head-thumping revelation at either kitchen table will make the effort surpass "worthwhile." I have one more bit of kitchen table wisdom to share with you. Imagine I'm using my best Mom voice here: Always take something for show-and-tell. It's so interesting to see what others are learning and doing and what excites them. You never know how one thing you show can inspire someone else, or what will inspire you. Connie, who was here this weekend, just returned from a Shino glaze pottery workshop, and it was fascinating to hear her talk about the variables that effect color when pieces are fired. I know absolutely nothing about pottery, but I could see all kinds of connections between her samples and things I do with natural dyes on fabrics, and constructed vessels of the textile sort. Jean, a felter, showed samples from a workshop she took with Lisa Klakulak of Strongfelt and two of the genius tools she bought from Lisa. I've used "no running water in my studio" as an excuse long enough. Now I want to explore some of my constructed vessel techniques using felt instead of fabric laminates. I'm putting that on the calender to make time for it this fall. Jean also brought some of her looping explorations worked in a beautiful spun flax using a variation I've heard called Danish Stitch. It's been a few years since I did much with this variation, and I've never really sampled it with a variety of materials. Add that to the calendar, too. What's happening at your kitchen table? And what will you take for show and tell? 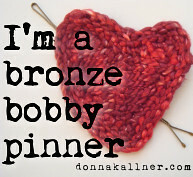 This blog has moved to http://donnakallnerfiberart.com. I hope you'll join the conversation there! Links to creativity exercises posted on my old blog. Text and images Copyright 2009-2012 Donna Kallner. Simple theme. Powered by Blogger.